I hope everyone had a great Thanksgiving holiday. We are back to work and thinking about Christmas!!! OMG! You MUST make this cheesecake for the holidays. 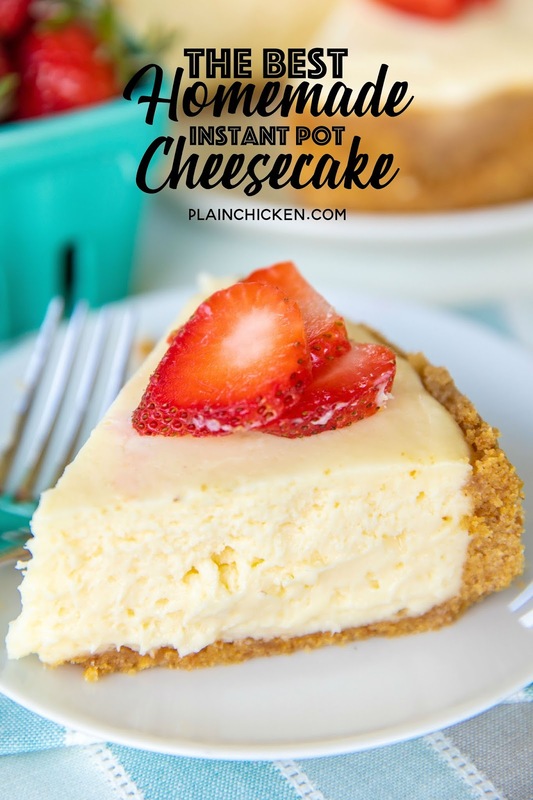 It is seriously The Best Homemade Instant Pot Cheesecake. I adapted it from my regular Best Homemade Cheesecake Recipe. It truly is the best cheesecake I've ever eaten. I am SO excited to share the Instant Pot version with you today. You are going to need a 7-inch springform pan to make this recipe. I know that it is annoying to buy special pans, but the 7-inch springform pan is inexpensive. 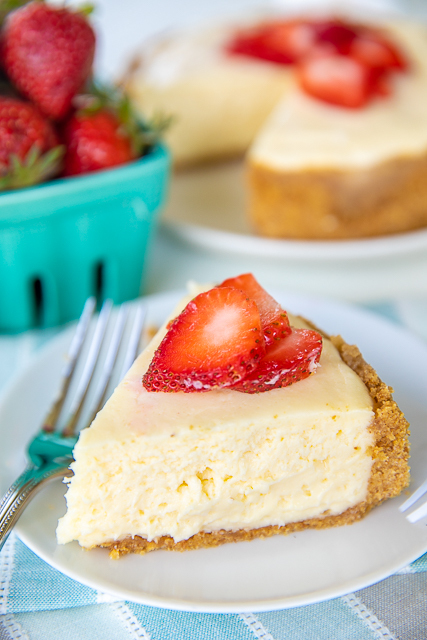 You are going to want to make this cheesecake all the time, so it is totally worth it! 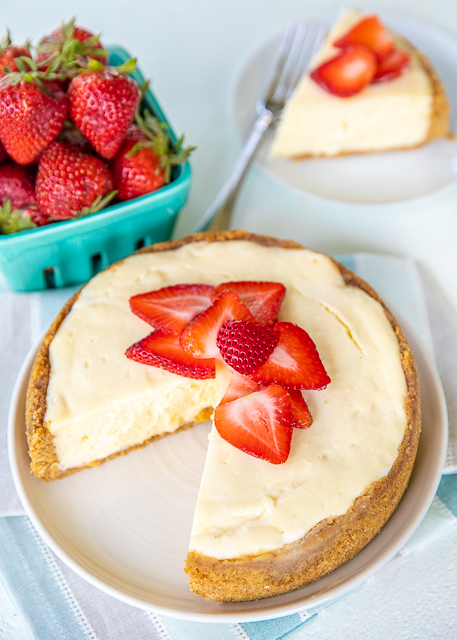 This Best Homemade Instant Pot Cheesecake is so light and fluffy. It gets the airiness from beaten egg whites. You gently fold them into the batter and it makes ALL the difference. 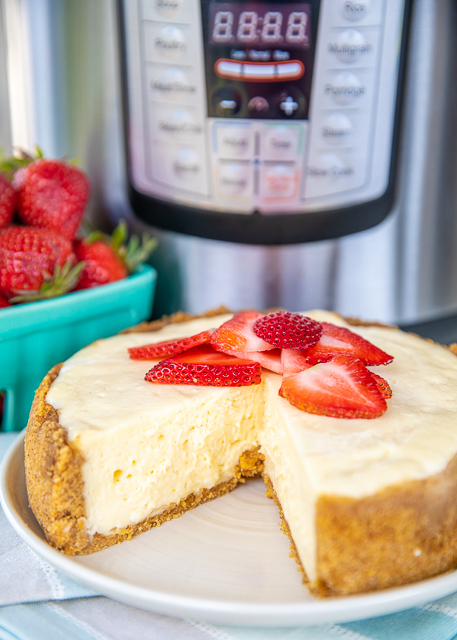 Once the cheesecake has cooked in the Instant Pot, you need to let it refrigerate overnight. It really needs that time to cool off and setup. You can also make this in advance and freeze for later. Just let it thaw in the fridge before serving. We really believe this is The Best Homemade Instant Pot Cheesecake. The two of us can eat this whole cheesecake in about 5 minutes flat. It is that good!!! 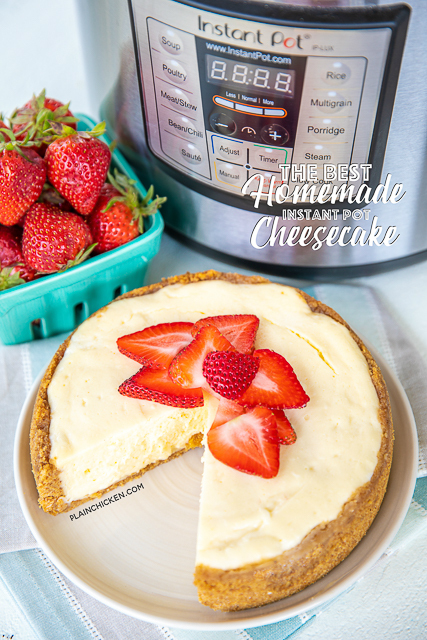 Since the cheesecake is smaller, it makes a great homemade gift! Just put it in a cute box, or wrap it in plastic wrap and slap a bow on top. Filling: In the bowl of an electric mixer, mix together cream cheese, sugar, 3 egg yolks, lemon juice and vanilla. In another bowl, beat 2 egg whites until stiff and creamy. Fold egg whites into cream cheese mixture. Pour into crust in springform pan. Wrap the bottom of springform pan with aluminum foil. Cover top of springform pan with another piece of aluminum foil. Pour 1 cup of water into bottom on Instant Pot. Place rack in bottom of insert. Place wrapped springform pan on top of rack. Lock lid in place and seal. Cook on manual or high pressure for 35 minutes. Let pressure release naturally. Remove cheesecake from Instant Pot and cool. Refrigerate overnight before serving. What size is your Instant Pot ? Just ordered the pan!! Since it is nonstick, you don't Pam the springform? To give as gift, are you able to slide a spatula under the chilled bottom to lift onto a plate? Thanks. Is it possible to cook two at the same time with the stackable pans? If so same amount of time? I have only cooked one at a time in the IP. You can certainly try it.